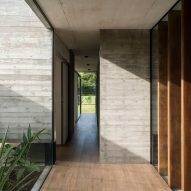 Argentinian architect Luciano Kruk has built a linear concrete house on the outskirts of Buenos Aires, with a slatted wood entrance and a large swimming pool in its expansive garden. 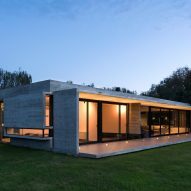 Based in the capital, Kruk used board-marked concrete to form the shell of the 1,711-square-foot (159-square-metre) Rodríguez House. The single-storey residence, rectangular in plan and section, is located on a spacious property in a gated community called La Esperanza. "Its streets, made out of compact calcrete and crushed stone, and are configured in accordance with the area's longstanding woods," said the architect's description. Landscape also played an important role in this project. 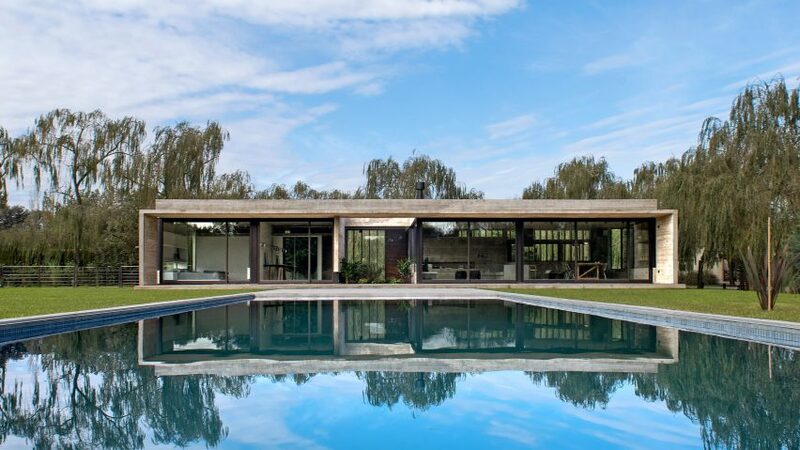 A reflecting pool is positioned at the entrance and a swimming pool is found at the back, while an expansive lawn and an internal courtyard offer more outdoor spaces. The building's structure is based on concrete load-bearing walls, which interact with inverted T-beams. 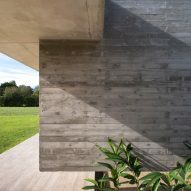 On approach, the front facade comprises lapacho (wooden planks) that hang vertically, atop a black flagstone base. This wood lattice design conceals "wet spaces", such as a kitchen, laundry room and bathrooms. 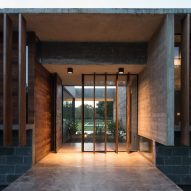 A raised concrete-slab floor serves as the entrance, while inside, a glass wall reveals the internal courtyard. 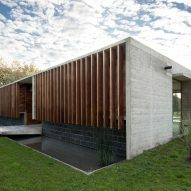 This sequence of spaces aligns perfectly with the outdoor pool, forming an axis perpendicular to the concrete building. 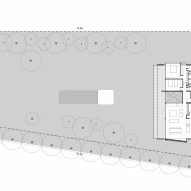 The home is split into two wings, with communal areas on one side and private spaces on the other. An open-plan living and dining room, with a galley kitchen, are all located to the left of the entrance, while two bedrooms and two bathrooms are to the right. 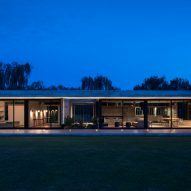 Sliding glass doors line the entire rear facade, opening to a covered patio that spans the length of the house. 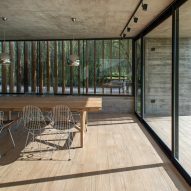 "The openness with which its joinery is designed from floor to ceiling allows for a complete integration between the inside and the outside," Kruk said. For interior decor, the material palette matches the exterior, with concrete walls, black cabinets and greyscale furnishings. Warm wood floors help to soften the rooms, and the odd wall is painted white for contrast. 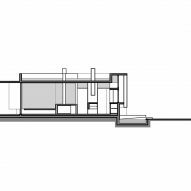 Designed for a young couple with no children, the house required possibility for expansion should the family grow. "They asked for a house with a pure external image and an uncomplicated inner distribution," Kruk said. 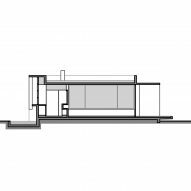 "They also requested a project for a future enlargement in view of the possibility to include a third bedroom." 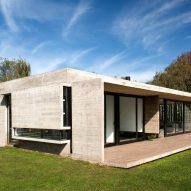 Rodríguez House is one of many concrete residences designed by the architect in Argentina. Others include a house with a similar reflection pool at its entrance, and another home in the woods that sits on a sandy lot.